Especially your very first adult sewing machine? Style? Cost? Features? I struggled with my first machine because I didn’t want to invest too much as a beginner. I just needed something to tinker with… Taking sewing classes to start is smart because you can learn and try out machines at the same time. But what about when you’re ready to buy? I didn’t want to spend too much yet I still wanted the best machine I could find for my purpose. Basic yet versatile, so I could easily try whatever type of sewing struck my interest. Well-built so I could sew comfortably and for many projects to come. And lastly, something I wouldn’t outgrow too fast. How much would that cost? What options were available? What’s a good value for the price? There’s lots of options, it’s hard to know where to begin. So here’s what I found during my research. Whatever your budget or purpose, hopefully this list will help you research and find just the right one. It’s a comprehensive list of home sewing machine manufacturers and the factors I used to narrow down options. You can get a decent well-built machine ranging from $70 – $160! $200 or below. Entry-level beginner machines usually range from $100- $499. To be honest, I wanted to see if I could get away with a kids’ hobby sewing machine for $100 or less but I found a vintage machine for $25 and went with that to start instead. Under $100 can get your kid a great first sewing machine or budding home sewer their very own machine to experiment on. Affordable enough to take the plunge, plus it’s cute! It can even get the savvy crafter a very functional sewing machine that will serve them well. Under $200 is generous enough to cover crafties like myself who need a solid basic they can rely on and grow with who doesn’t want to invest in the holy grail of sewing machines yet until they find what kind of sewing they’d like to focus on most! $499 can buy a machine that can handle the seriously savvy or creatively crafty mom who not only sews for their pleasure but can double as a tailor, halloween costume maker, throw pillow/curtain/tablecloth maker and casual accessories designer/etsy shop owner on the side. It’s a strict budget but it’s realistic. It can buy a trusty sewing machine that can both perform all the essentials and grow with you at the same time. Great for the dabbler, great for the serious kid learner, crafty mom, or for an adult learner like me who wants to gradually try it all. Straight Stitch, Back Stitch, and Zig Zag Stitch are all I needed. They are also the 3 most basic and most essential stitches needed for all beginning to intermediate sewers. Every modern sewing machine comes standard with these stitches. Removable Sewing Bed. Hemming pant legs or sewing cuffs? Working with sleeves or skirts? Anything tubular where you will have to sew around the edge of a ring is difficult without this feature. The base of the sewing machine will pop out revealing an arm-type base. You should be able to slip a sleeve or pant leg on there and sew it around. Not all modern sewing machines come with this feature. Foot Pedal Operated. Every modern sewing machine comes standard with foot pedal operation. Vintage machines do not though. They can come with anything from a knee pedal to a hand crank. Sewing Feet and Bobbin Winders. Like detachable feet for Zipper or Button-hole makers, and Bobbin Winders. Bobbin Winders and Zipper Feet usually come standard with modern machines. Reliable Stitch Length/Tension Control. Adjustable Tension Control is also standard among all sewing machines. Being able to control how tight your stitches are is handy for basting and working with different textiles. A machine that can do this reliably and accurately is important and not all machines can promise this. Durability. How long the machine will last, if the feed dogs can reliably feed different textiles through, and how accurate the stitches are are what make a sewing machine reliable and durable to me. Perhaps if it can sustain long periods of accurate sewing at its maximum speed is also a factor. Compact. Size was an important factor for me. The smallest full-featured one I could find, as portable as possible, that could do all the basics reliably and durably. One I could tuck away if I had to (TINY apartment) or keep out but still be pretty low-profile. You’ll need a lot of space to work with fabric for pinning, marking, and cutting. Hey, New York is crowded and space is a premium! Knobs instead of Buttons. Easy to control, ergonomic knobs are what I prefer. I’d rather turn the knob than push the buttons in a certain order to program my machine. In fact, the less options the better for me. All that stuff is fun, like pre-programmed embroidery letters for monograms but I didn’t need it. Knobs are less common than button panels in more advanced sewing machines. Hard Traveling Case. I have to constantly set up and pack away my machine so I needed a hard case to store and/or transport it easily. Most come with a dust cover but aren’t suitable for storage or moving. I found meager options and sewing machine manufacturers don’t even offer it as an option for each machine… Hard Cases can be purchased separately but they usually don’t fit the machine and are bulky. Ideally I wanted one that was built for my machine specifically. BOO! ❤ What Do You Want To Sew? Embroidery, Home Decorative, Clothing, Accessories, Craft, and Quilting are just some of the sewing projects you can do with your sewing machine. Some require long-arms or larger sewing beds to accomodate large pieces like for Quilting. 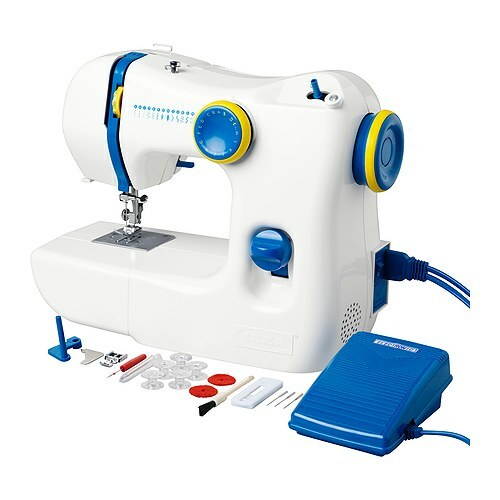 Some require heavier duty industrial sewing machines and needles to sew through multiple layers of thick material for sewing Accessories like leather purses or upholstery. Some will require removable beds and fine stitching for say tailoring or Clothing. I’m a Hobby Home Sewer. I will want to try all of the above mentioned types of projects on a basic level at some point. And I want my machine to be readily able to handle it! From sewing clothings, throw pillows, tailoring, quilting, and general crafting like stuffed animals, perhaps maybe my own halloween costume one year… With a focus mainly on Clothing and Fabric Accessories and eventually tailoring. Most low-end entry level sewing machines will focus on being able to accomodate Clothing and Crafty type projects. The higher end machines are where more advanced features specific to expertise will come into play. If you’re like me, then you can get a well-built machine that’s a good value you can grow with for well within $200. Visit some sewing machine dealers if you can to try out some machines! Shop online. Ask yourself what kind of sewing you’d like to do and talk to your sewing teacher or crafty friend for some advice too! Many sewing schools will sell sewing machines too. Visit Sew Review to get an idea of what options are out there. 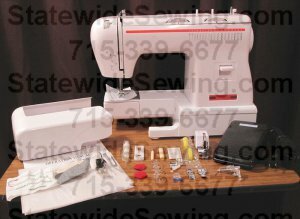 They have a very comprehensive list of sewing brands and models including handy info, descriptions, and pictures of machine models by brand, and prices. They also have Buying Guides and Reviews! Amazon.com reviews are great too. See My Full List of Sewing Machines and Tools. When ready to buy, buy from a reputable dealer or some place where you can easily return your machine if it’s defective or if you hate it, like Amazon.com. Just be aware that cheap machines should be cheap because they’re basic and not because they’re poorly built. A cheap poorly built machine is useless. You will not be able to sew properly on it and it will make sewing much harder. It’s your major tool and having a trusty reliable tool is essential in making sewing fun. I own the Vintage Singer Treadle 66, $25, and the Singer Fashionmate 7256, $160. My personal pick was the Singer Promise 1409, $91.99. It had everything I was looking for down to the knobs (except the hard case) and was under $100! Super basic but well-built and durable. I rather like the plain vanilla government issue look too! The sewing machine in the opening pic is not featured because it’s an especially great buy but because it looks grrreat!!! It’s a modern hand crank machine with no removable bed, sews one stitch style – Straight Stitch, and does have adjustable stitch length, and additional presser feet. So it’s entirely manually operated, one hand will have to feed the fabric while the other hand turns the crank to make the machine sew. Not ideal in today’s modern age of technology (e.g. electricity!) but worth a mention because 1. It’s cool looking. 2. It’s a modern machine, not vintage, that uses a hand crank. On purpose… A rarity these days. (And great I guess if we were stuck in a Walking Dead-type apocalypse situation and needed to sew life saving curtains…) 3. It’s India’s foremost appliance and sewing machine brand. Kind of like if our Singer Sewing Co. was also Braun or something. Novel.